A troll fisherman catches and immediately releases a small salmon, making trolling the most selective salmon fishery. 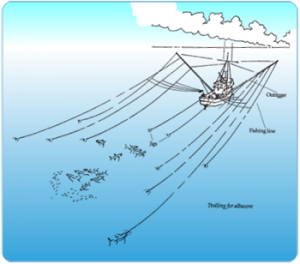 Troll fishermen use hooks and lines, towed behind their vessels at low speed, to catch salmon. 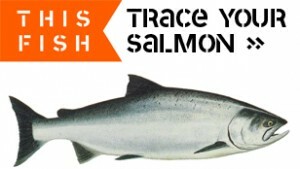 It is the slowest and most selective method for harvesting salmon. The hooks are attached to lures that imitate the salmon’s food, such as herring and squid. Each fish is individually caught and the line is pulled in with a hydraulic winch. However, fishermen must haul in each salmon by hand for the last 20 to 60 feet—a struggle in which the skill and agility of the fishermen is paramount. 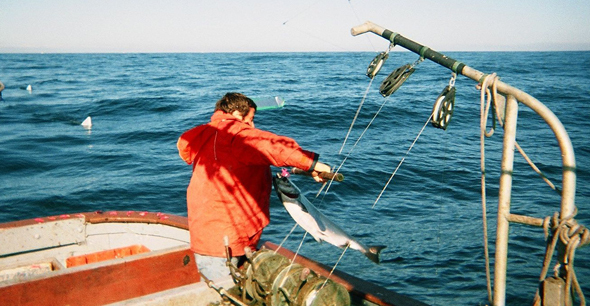 Trolling uses hooks and lines, along with polls and pulleys, to selectively catch salmon. Two studies in Canada and the United States also identified trolling as having one of the lowest impacts on the marine environment. Shifting Gears: Addressing the Collateral Impacts of Fishing Methods in U.S. Waters found that trolling has the least impact on marine habitats and the lowest rate of bycatch (unwanted fish). A similar Canadian study found the same results: on a scale of 100, with zero being the least severe impacts, trolling scored 22. “Hook and line gear…was considered to have low impacts on habitat and bycatch,” states the study How We Fish Matters by environmental groups. The sustainability and selectively of troll-caught wild salmon have made their catch highly sought after by the top restaurants in Japan, Europe and the United States. The hand-caught and slow nature of the fishery also ensures that each fish is of the highest quality. This entry was posted on Tuesday, January 11th, 2011 at 9:00 pm	and is filed under TROLLING and tagged with sustainability, trolling. You can follow any responses to this entry through the RSS 2.0 feed.